The world is full of landfills full of bikes, here are some thoughts about alternative ways to utilize a salvage bicycle. 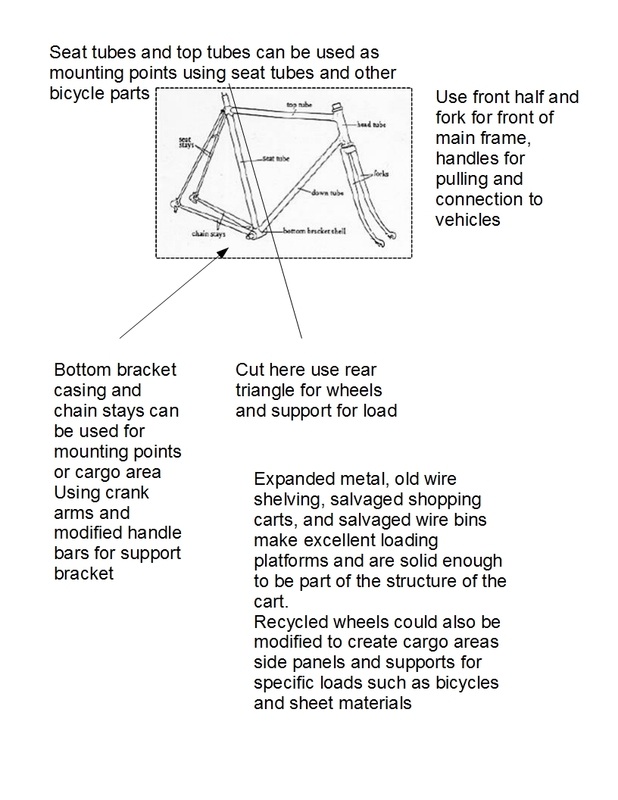 If we use the seat tubes, frame elements, head tubes and drop outs, for the connecting points. And seat posts, Stems, handle bars, crank arms, pedals, hubs, and bar ends for the connectors, we won’t have to machine these elements and it will make a bolt together assembly a lot easier and cheaper to create. Using salvaged expanded metal, wire shelving, shopping carts, and other metal storage bins for the cargo areas will add to the strength of the cargo area and in some cases be the whole cargo area ready made and already designed around standards in boxes, baskets, etc for a variety of uses. Connecting pieces, cargo support, handles for wheel barrow like use. Rotating joints for folding frame or cargo elements. This entry was posted in Design Considerations and tagged bicycles, bike, carts, Cleveland, ohio city bicycle coop, permaculture, trailers. Bookmark the permalink.